Comments: The Me-209v1 was built for one purpose and one purpose only; to break the world's speed record for aircraft. There was stiff competition from Heinkel and the He-100 as the record passed back and forth between the two. If not for the intervention of German high command who favored Messerschmitt and the start of WWII, the record would probably have been held by the He-100 as it was the superior airframe. As it was, the Me-209v1 held the record at 469mph. This record was not to be broken until 1969 when Darryl Greenameyer's highly modified F8F Bearcat finally eclipsed the record set thirty years prior. The Me 209v1 was basically an engine wrapped with the smallest airframe that could fly. Pilots that flew the aircraft tell of it being a vicious handling aircraft, unlike the He-100 which was much larger and more stable. The lack of coolant radiators meant that the aircraft could only remain airbore for a short time before engine overheating became a major problem. It also meant that the 209v1 was a pocket rocket once fully at speed. Huma's kit of the 209v1/v3 is the smallest kit I have built in a very long time. Optional parts include the longer wing of the v3 and a modified engine cowling which included machine guns as a 'fighter' version was built (the v3) to continue the fiction that the 209 was a front line fighter. I had almost no problem building the kit especially as there are not that many parts in a 3'' x 4'' kit! The interior is quite complete with seat, stick, and instrument panel. 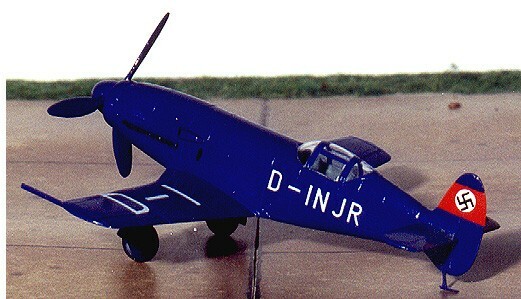 I painted it in RLM grey although I would be willing to bet it was actually not painted at all for the record flights. The only spots that need careful building are the horizontal stabilizers, since there are no positive locators for them, and the tail skid, which is also difficult to position. Other than that, the kit is a breeze. I painted the kit an overall dark blue, including wheel wells, struts and propellor blades as mentioned in the excellent instructions. Huma has among the best instructions of any company, giving not only excellent building instructions, but also includes photographs and a relatively complete history of the aircraft. Their decals react very well with setting solutions, but are flat. I cut out all the carrier film from the large wing registrations (it is a civil aircraft), and had to paint the red band on the tail for the national insignia. The kit is a blast to build and even though it has been a number of years since I built the kit, it has a permanent place on my display shelves. 2008 Update. Over the years, the price of these kits has dropped and they are now available in a box. This and many of my older Huma kits came in a bag.